Ton first got a university degree in the Dutch language writing a thesis about the use of machinery and special effects on the stages of the 17th and 18th century European theatres. He briefly studied the recorder at the Utrecht Conservatory, but came to prefer the harpsichord and its repertoire. He decided to continue in this direction and started his training in 1982 as an apprentice in the workshop of Joop Klinkhamer. Within a few years he was invited to become partner and he is now the manager of the company. 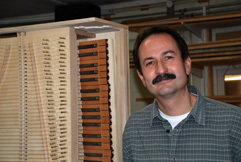 An amateur harpsichordist himself (he won Haarlem’s amateur harpsichord competition in 1988), he is an expert keyboard maker who also specializes in voicing, regulating and tuning. As a professional tuner he has contributed to recordings for such labels as Globe, Ramée, Glossa and Wildboar, and as a harpsichord technician he has traveled extensively in Europe and to Japan, Korea, the U.S.A. and Canada, servicing instruments and giving courses on tuning and maintenance. 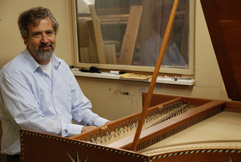 He is responsible for harpsichord maintenance at both the Amsterdam and Utrecht conservatories. These activities are guided by his belief that a well-maintained harpsichord is essential to any serious player, a point which he feels is too often neglected by players and builders alike. This is why he travels so extensively: to keep the instruments in shape. Ton is also a qualified translator of Spanish, coordinating the contacts with our Spanish speaking customers. Christiaan has been with the company for over 35 years and has a thorough and comprehensive technical background. He worked as a draughtsman for several architects before he made building musical instruments his passion. 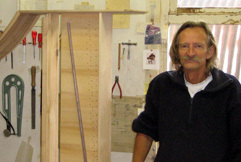 He makes all our drawings and is an all-round woodworker with an extensive knowledge of all the pittfalls in harpsichord and fortepiano construction. He specializes in restoration techniques such as French polishing, inlay and gilding. His ‘Magnum Opus’ is the restoration of the 1800 Clementi Fortepiano from the ‘Palacio de Queluz’ in Lisbon, Portugal. Joop is the founder of the company. Through his sister Thérèse de Goede, now a professor of Historical Performance Practice at the Amsterdam Conservatory, he fell in love with the harpsichord and the interpretations of Gustav Leonhardt. This changed his career plans and in 1972 Joop began as the first European representative of Zuckermann Harpsichords, USA, made by David Way, who himself had been taught by William Hyman. Both the study of these instruments and the work of Frank Hubbard (Three Centuries of Harpsichord Making) enabled him to start the design of his own instruments in 1978. Grant O’Brien’s book on Ruckers’ harpsichords (1990) was also an important influence on him. Over a period of 35 years, Joop developed a comprehensive knowledge of authentic harpsichords and their action, doing research and measuring historical keyboard instruments in musical instrument collections all over the world. Joop loves to play and improvise on both the fortepiano and the harpsichord, confessing to a great affinity for the French 17th-century ‘Préludes non Mesurés’, but not shunning Mendelssohn on the later fortepiano either.